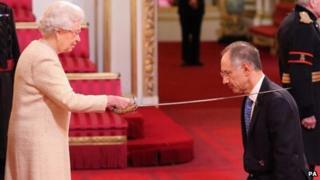 Cardiff-born billionaire Michael Moritz has received a knighthood from the Queen at Buckingham Palace. Sir Michael, who made his money from venture capital investments in Google, YouTube and LinkedIn, is being honoured for promoting British economic interests and philanthropic work. Last year he donated £75m to Oxford University, where he studied, to help disadvantaged students. The Queen announced he would be knighted in her Birthday Honours list. Sir Michael, 59, who lives in America, has previously told the BBC he was "startled and flattered" by the news of the honour and "thrilled to be considered a productive British export". He has been made a Knight Commander of the British Empire (KBE), which can be given to Britons based abroad or in an honorary capacity to foreign nationals. Sir Michael attended Howardian High School in Cardiff before graduating in history at Christ Church College, Oxford in 1976. The father-of-two worked as a journalist for Time magazine before joining venture capital firm Sequoia Capital, where he is now chairman. According to this year's Sunday Times Rich List, he was the 70th richest person in the UK, overtaking billionaire entrepreneur Sir Terry Matthews to become Wales' richest person. Sir Michael has committed himself to giving away at least 50% of his wealth and has given millions to his former Oxford college. He announced last year he had been diagnosed with a rare medical condition which could be managed but was incurable.